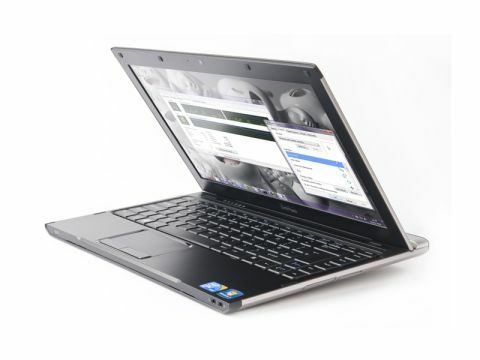 Given that Dell's Adamo and Vostro laptops occupy precisely opposite ends of the computing spectrum, their lovechild – the V13 – is a fascinating specimen. It's everything we never thought either the Vostro or Adamo ranges would be: a razor-thin, highly desirable laptop designed for workers, with a spectacularly low price. At the low end, you could buy one of the best-looking laptops around – arguably the most handsome Dell has ever produced – for just £359. The V13 feels great. It's eminently portable at 1.6kg, but the low weight, which edges it towards ultraportable territory, doesn't equate to a flimsy-feeling laptop. The back of the screen feels solid and shock-resistant, and the aluminium casing gives the V13 a truly premium feel. We're also fans of the all-in-one case design, which looks both lovely and tidy. The V13's portability isn't all encompassing, though. The battery is a clear weak point for anyone who spends a lot of time away from the mains, or would rather leave the charger behind. With the V13 loaded down by applications, it survived barely two hours on battery power alone; left with the screen on and nothing happening it managed four hours. Fairly respectable, but far short of what's frequently being achieved by cheaper netbooks. But there's no sign of penny pinching when it comes to the screen. Measuring 13.3in diagonally and with a practical if unspectacular resolution of 1,366 x 768, the unglossy TFT is easy to read, and we only found that the brightness needed boosting when the monitor was in direct sunlight. There are even a few luxuries – a webcam in the bezel of the screen and an SD card reader hidden away on the right-hand edge. Otherwise, the ergonomics are good, although perhaps not quite as premium-feeling as the rest of the system. The keyboard and the rest of the interior are clad in matte-black, which can feel a little oppressive, and the keyboard's base has a distinct and noticeable softness to it. You get used to it fast, but compared to the solidity of a ThinkPad or Sony S-series keyboard, it fares relatively poorly. A bigger hurdle to getting things done on the V13 is its performance. As is standard for Dell, you can customise your machine to within an inch of its life before you buy it, but the very fastest processor you can opt for is an Intel Core 2 Duo SU7300 with a clockspeed of 1.3GHz. While this processor doesn't exactly blaze along, it's certainly faster than the Core 2 Solo SU3500. While this CPU runs ever so slightly faster at 1.4GHz, the absence of an entire processing core means that you'll have to pick and choose your applications quite carefully. Our review system came with 2GB of RAM, and even that didn't mean smooth-running HD video. Internet Explorer began to choke once we had a few tabs open, so anyone intending to make the V13 their only computer – for home or for work – should think carefully. At least you won't have to worry about storage in the near future, since the 320GB mechanical disk featured in our review unit is unlikely to fill up particularly quickly. Alternatively, you can opt for a 500GB model, for which you'll stump up an extra £60. In fairness, there's not a huge price difference between the top-end V13 and our review model – only £90 in fact, and we'd argue that's well worth it. For the extra cash you get the same beautiful design and build quality, plus an entire extra processor core and 4GB of RAM instead of 2GB, which gives a more practical level of performance for those who want a laptop that performs well in a variety of situations. But, performance issues aside, it's stunning to see such a good looking, well-made, cleverly designed laptop available for under £500. Indeed, if you have only the most basic computing needs, you could bag the lowest-end V13 for a mere £359. Just don't forget to lie about how much it cost.